Now don't get me wrong...I really like Tim Ferriss and his books, hacks, and inspirational goals. He seems to polarize with his material though: either you love his material or are secretly cursing him for making you feel like an underachiever. This post is a public service announcement for those entrepreneurs who, for many years, have been misinterpreting, misusing, or just missing his techniques from The 4-Hour Workweek. Here are some of the benefits of his books, as well as some of the potential #entrepreneurfail moments related to it, so you can proceed with caution. Simply put, in all of his books, Tim Ferriss stitches together his knowledge, methods, hacks and accomplishments based on the mini experiments he's conducted and the empirical results he has achieved. For the new entrepreneur there are many little nuggets of wisdom that can be adapted to simplify and succeed as a small business owner. Here's the problem: Many entrepreneurs assume FAST RESULTS when they hear '4-hour week'. They don't realize that to get to this point, entrepreneurs may have to put in some 100-hour weeks. Don't forget that Tim Ferriss probably still doesn't work a '4-hour week,' since he is probably busy creating the next book for us. Also, if we all just work 4 hours a week, who will be doing the grunt level of work in our society.? 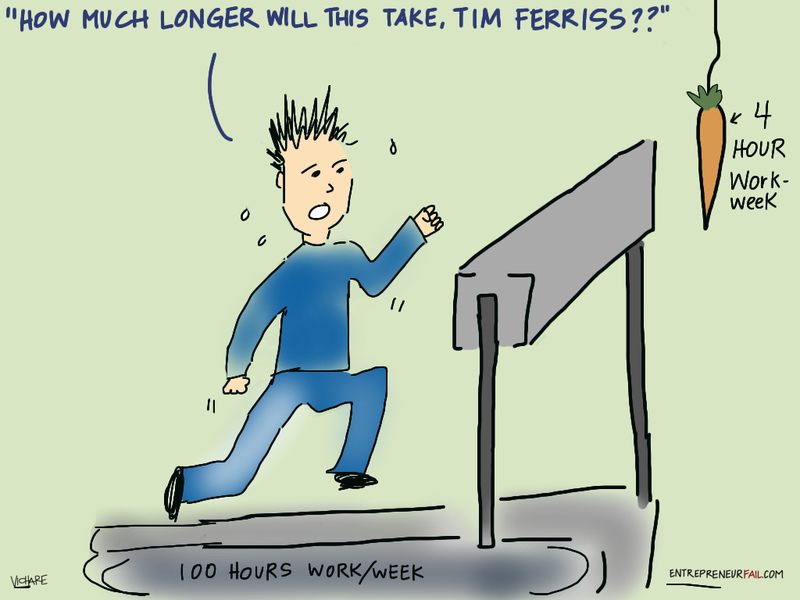 Another issue for us mere mortals, as David Seah admits in his review of the 4-Hour Workweek, that many of Tim Ferriss' recommendations are a challenge to complete. Entrepreneurs are already under so much pressure, so the added pressure of working many long hours, and not seeing the galactic results is overwhelming. And finally, in the 4-Hour Workweek, Tim Ferriss recommends outsourcing for growing a business. But guess what…you'll find entrepreneurs outsourcing not only the ancillary functions of their business, but also the business development, the secret sauce, and the core business operations. This is a recipe for disaster, and true entrepreneurs know that the key business functions need to stay in-house to truly differentiate and provide value. All in all, I'm sure you'll get some pointers if you haven't picked up his books yet. Just tread cautiously as you dive into his methods. Let us know what you think of the books: Four-Hour Workweek, The Four-Hour Body, or The Four-Hour Chef in the comments below. Are you a fan or a skeptic when it comes to Tim Ferriss? Anyone interested in entrepreneurship should get: Persona Brand Planning for life, available on Amazon to determine their unique skill set and persona so that they can market their entrepreneurial idea(s) more effectively. On the off chance that we go for more benefit internet exchanging is the best alternative for us which makes us wealthy in a matter of moments. Now and then in the event that we don't have a clue about its nuts and bolts which are comprehend by www.formatgenerator.com/ site which influences us to depend on this exchanging. I additionally prescribe this article to peruse by the general population who are keen on this work. Innovation has no restriction and numerous experts who are attempting to improve the innovation trust that they need to read more for change the world with their innovation for the general population. Indeed, even in the composing the part of innovation has been depicted so that everybody comprehends its idea and way. Very informative blog post, As shown by me, each social event is endeavoring to play the best redirection and therefore, they arranging so well. Here you can visit this https://www.besttranslationservices.com/german-translation-service/ site and get numerous new thoughts. Decent site, Getting prepared is in like way unbelievably strong in the difference in the general people as it is essential for the impression of cerebrum get some information about http://www.professionaltypist.net/how-to-type-resume-correctly-in-quick-terms/ site to manage any kind of writing work.